New this month Revealing mistake: After Mary Robert jumps out of the car you can see the stunt double falling for her. Visible crew/equipment: When Eddie arrives at the casino near the end of the film, he opens the car door and in the reflection you can see the filming crew. Factual error: At the very end of the movie, the Pope gives the nuns a standing ovation. The other people seated in the box with him should have immediately risen at this time. Instead, the man seated to his left looks up at him, seeing that the pontiff has stood, but makes no movement to join him on his feet. 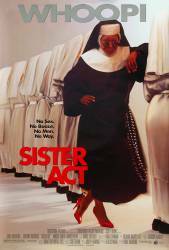 Continuity mistake: When Whoopi first takes over the choir, she asks the sisters to stand according to their singing voices. She asks where the sopranos are, and several women on opposite corners of the grouping raise their hands. She asks them to all move over to the left group, but only one of the two women on the right side actually does so. Character mistake: During the end credits, three of the magazine covers spell Whoopi's character's name as "Delores." Two of the covers spell it "Deloris," as do the credits. Suggested correction: I wouldn't call this a mistake per se. Deloris was not particularly famous at that point and both versions of spelling are relatively common for that name. Taking into account that media regularly misspells celebrity names, I would actually attribute this one to realism. Continuity mistake: When the choir are singing the first song that Deloris helps them with, Sister Mary Robert gains confidence and sings louder. Toward the end of the song, she puts her hands together in a praying gesture while she is singing loudly, but in the next shot her arms are by her side. Other mistake: During the 'Rescue Me' montage, when Maggie Smith catches Whoopi Goldberg singing whilst washing the car, Whoopi reacts to her and then there's a brief moment where she looks straight at the camera. Plot hole: Delores is walking into the murder scene at the beginning of the movie just as Ernie is shot. Later, while she is being questioned, she tells the two detectives what the thugs said and did, yet, she was not eavesdropping or looking through the door. Plot hole: In the scene where the limo driver gets shot, Deloris walks in just as the bullet is fired. She doesn't see what happened before, just the guy getting shot. However, when she is telling the police what happens, she tells them that Vince looks at Ernie and says 'Good night.' He did, but she wasn't there at that point. Suggested correction: The only genuine mistake is that Doloris wouldn't see Vince looking at Ernie or Joey but as the office door is glass, she would be able to hear them talking. Example being when Deloris leaves and is standing outside with the door closed she can hear Vince telling Willy and Joey to bring her back for a talk or, if she runs, to "take care of it". Except that she never stood outside the door listening to the entire exchange. As soon as she got to Vince's door, she didn't stop to listen to the entire meeting she immediately opened the door, walked in and witnessed the murder and nothing else. Plus, about five seconds after Vince says, "Say, goodnight, Ernie", is when Delores arrives. Continuity mistake: When Deloris is on TV, we see her lift a stuffed rabbit to try and hide her face, she then gives it to Mary Robert and lifts the kid to her face but when Eddie says "I'm gonna kill her. I'm gonna kill her myself", if you look on the TV, you can see her doing the exact same thing again. Biker: If this turns into a nuns' bar, I'm outta here! In the last scene, when the choir sings at the church, the Blues Brothers can be seen on the background in exactly the same position as the church number in the Blues Brothers film.